If you look on the Eli Lilly website or check their wiki page you will get some vague explanation about how Mr. Lilly got his start and what his first potions actually were. This is what it says: From its facilities in Indianapolis the company manufactured and sold “ethical drugs” for use by the medical profession. 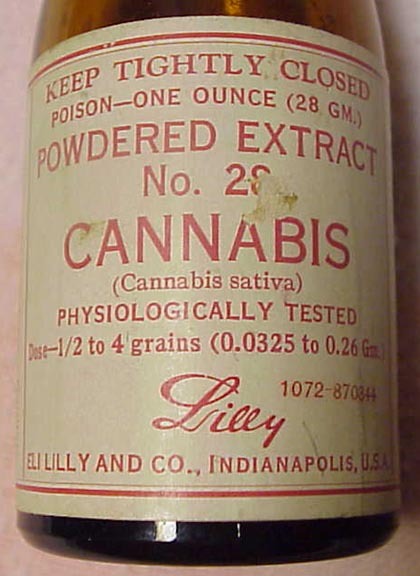 Lilly’s medicines included labels that disclosed product ingredients. And what do you suppose these ethical drugs were? That’s right…Cannabis Extract. Also Cocaine Extract. Now you know why of the first 3 scientists hired 2 were botanists and one was a chemist. This entry was posted in Big Pharma Surprise Facts. Bookmark the permalink. Why do they no longer sell Cannabis Extract ? Did they prove it had no medicinal value ? Well, obviously not as the US government’s patent on it’s use proves beyond a doubt that has healing benefits. So why then, does big pharma no longer offer it for sale? BECAUSE YOU CANNOT PATENT IT ! In other words they cannot exploit it for their own gain so everyone loses. Physiologically Tested … hmmm .. I wonder what those tests prove exactly ?